HDTV surveillance with high-speed, 16x zoom dome for indoor use. Axis Q6034 PTZ Network Dome offers HDTV video, 18x optical zoom, and high-speed pan/tilt performance for exceptional coverage of large areas and great detail when zooming in. Designed with an IP52-rating for easy and reliable indoor installation, Axis Q6034 PTZ Network Dome is ideal for use in airports, train stations, casinos, stadiums and shopping malls. 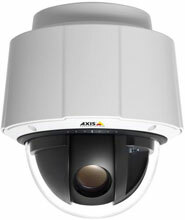 Axis Q6034 PTZ Network Dome provides 18x optical and 12x digital zoom with autofocus. Due to its HDTV resolution, the camera's 18x zoom provides not only a level of detail that is comparable to a 36x-zoom, 4CIF camera, but also the extra advantage of a wider, 16: 9 field of view. Axis Q6034 PTZ Network Dome features the Advanced Gatekeeper functionality, which enables the camera to automatically move to a preset position when motion is detected in a pre-defined area. The camera's day/night functionality ensures high image quality even in low light conditions. Q6032-E Pendant Kit. 1.5 inch NPT thread adapter for pendant mount. For connecting to ceiling mountings with 1,5 inch NPT thread. T91A64 Corner Bracket. Requires (Part# T91A61) Wall Bracket. Mounting tool used to secure housings and mounts to poles. Used with steel straps which are included in pole mount kit. The Axis 0363-004 is also known as AXC-0363-004	or 0363004	.